For other uses, see Gelert (disambiguation). Gelert (Welsh pronunciation: [ˈɡɛlɛrt]) is a legendary dog associated with the village of Beddgelert (whose name means "Gelert's Grave") in Gwynedd, north-west Wales. The story of Gelert is a variation on the well-worn "Faithful Hound" folk-tale motif, which lives on as an urban legend. It is classified as Aarne–Thompson type 178A. Here, the dog is alleged to have belonged to Llywelyn the Great, Prince of Gwynedd, a gift from King John of England. In this legend, Llywelyn returns from hunting to find his baby missing, the cradle overturned, and Gelert with a blood-smeared mouth. Believing the dog had savaged the child, Llywelyn draws his sword and kills Gelert. 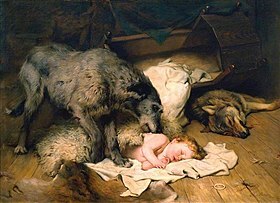 After the dog's dying yelp Llywelyn hears the cries of the baby, unharmed under the cradle, along with a dead wolf which had attacked the child and been killed by Gelert. Llywelyn is overcome with remorse and buries the dog with great ceremony, but can still hear its dying yelp. After that day Llywelyn never smiles again. This story formed the basis for several English poems, among which are "Beth Gêlert; or, the Grave of the Greyhound" by William Robert Spencer written around 1800; "Beth Gelert" by Richard Henry Horne; "Gelert" by Francis Orray Ticknor and the dramatic poem "Llewellyn" by Walter Richard Cassels. The tale is also alluded to by John Critchley Prince in lines 24 to 29 of his poem "North Wales:" "Thou hast not trod with pilgrim foot the ground / Where sleeps the canine martyr of distrust, / Poor Gelert, famed in song, as brave a hound / As ever guarded homestead, hut, or hall, / Or leapt exulting at the hunter’s call; / As ever grateful man consigned to dust." 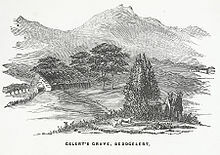 Despite this, and despite the presence of a raised mound in the village called Gelert's Grave, historians do not believe that Gelert ever existed. It is recorded in Wild Wales (1862) by George Borrow, who notes it as a well known legend; by Brewer's Dictionary of Phrase and Fable, which details versions of the same story from other cultures; and by The Nuttall Encyclopaedia, under the Anglicised spellings "Gellert" and "Killhart". John Fiske discusses Gelert in his Myths and Myth-makers, saying regretfully that "as the Swiss must give up his Tell, so must the Welshman be deprived of his brave dog Gellert, over whose cruel fate I confess to having shed more tears than I should regard as well bestowed upon the misfortunes of many a human hero of romance." He notes that "to this day the visitor to Snowdon is told the touching story, and shown the place, called Beth-Gellert, where the dog's grave is still to be seen. Nevertheless, the story occurs in the fireside lore of nearly every Aryan people." The tale indeed appears in numerous cultures with minor variations. The Alpine ligurian poem R sacrifisi dr can, written in Ligurian, tells of how a shepherd shot his sheepdog after finding it covered in sheep blood, only to later find a dead wolf in the stable. In India, a black snake replaces the wolf and a mongoose replaces the dog. In Egypt, the story goes that a cook nearly killed a Wali for having smashed a pot of herbs, but later discovers that the pot contained a poisonous snake. In Malaysian folklore, a similar story involves a tame bear, kept by a Malay hunter as the guardian of his young daughter. As in the story of Gelert, the hunter returns home from an expedition, and finds his daughter gone and the bear covered in blood. Hastily thinking the bear has devoured his daughter, the hunter kills it with his spear, but later finds the body of a tiger, killed by the bear in defence of the hunter's daughter, who shortly emerges from the jungle, from where she took refuge. In the Disney movie, Lady and the Tramp (1955), the Tramp is carried off to the pound after Aunt Sarah finds him in the baby's room with the cradle overturned. Luckily, Lady manages to show Jim Dear the big, dead rat behind the curtain, and they realize that the Tramp saved the baby. Happily in this version of the tale, "Gelert" is saved in time. In 2002 the Incredible Story Studios made a short film called "The Return of Gelert", written by a Welsh schoolchild, which depicts the ghost of Gelert returning to haunt early 21st century Beddgelert. It is now accepted that the village of Beddgelert took its name from an early saint named Kilart or Celert, rather than from the dog. 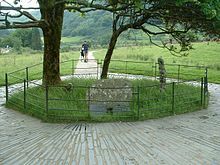 The "grave" mound is ascribed to David Prichard, landlord of the Goat Hotel in Beddgelert in the late eighteenth century, who connected the legend to the village to encourage tourism. ^ Jenkins, D. E. (1899). "Chapter V. The Legend of Gelert". Bedd Gelert: Its Facts, Fairies and Folklore. Portmadog: L. Jenkins. pp. 56–74. ^ Spencer, William Robert (1921). "Beth Gêlert". In Curry, Charles Madison; Clippinger, Erle Ellsworth (eds.). Children's Literature. Chicago: Rand McNally. pp. 436–437. Retrieved 29 October 2011. ^ Horne, Richard Henry (1846). "Beth Gelert". Ballad Romances. London: Charles Ollier. pp. 187–202. Retrieved October 29, 2011. ^ Ticknor, Francis Orray (1911). "Gelert". The poems of Francis Orray Ticknor. New York & Washington: The Neale Publishing Co. p. 85. Retrieved 29 October 2011. ^ Cassels, Walter Richard. "Llewellyn". Archived from the original on 2011-12-02. ^ "Boy's story made into Disney film". BBC News. 10 January 2002. Retrieved 28 April 2017. ^ Davies, John; Jenkins, Nigel; Menna, Baines; Lynch, Peredur I., eds. (2008). The Welsh Academy Encyclopaedia of Wales. Cardiff: University of Wales Press. p. 306. ISBN 978-0-7083-1953-6. Borrow's Wild Wales Chapter XLVI: "The Valley of Gelert"
John Fiske's Myths and Myth-makers: Old Tales and Superstitions Interpreted by Comparative Mythology Chapter 1: "The Origins of Folk-Lore." Wikimedia Commons has media related to Gelert. Wikisource has the text of the 1911 Encyclopædia Britannica article Gellert. Horne, Richard Henry (1846). "Beth Gelert". Ballad Romances. London: Charles Ollier. p. 187.